"Try sitting in the chair, Commander. No one can understand until they sit in the chair." What does disability mean in the future? Will we ever get to the place where a more flexible definition of ability exists? What is "abled," exactly, when we live in a universe with Vulcans and Klingons, and other creatures possibly stronger than we are? And what does all this have to do with the mystery known as Julian Bashir? I had the "disability" episode of TNG as well; in Loud as a Whisper, the Trek franchise explored issues surrounding communication differences and being Deaf, and still resonates today in many ways. This episode displays a more DS9 perspective, and manages to resonate with an entirely different approach to the theme. Ensign Melora is a roving Starfleet officer from a low-gravity species who's chosen to live in a different environment, away from her family. 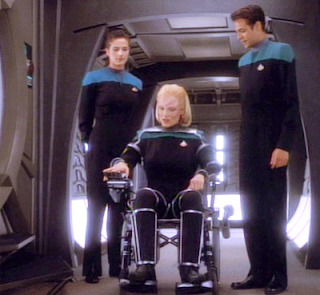 To do so, and to pursue a career in Starfleet – whose ships use primarily Earth-gravity norms – she's had to use equipment resembling modern wheelchairs and physical support systems. This has turned her into a perhaps overly defensive high-achiever. Despite my general caution when watching disability themes in film and television, the first part of this episode slowly won my grudging respect. Melora does it all, and though she has problems, she powers through. Bashir's naturally attracted to her as a fellow overachiever; they bond over the truth that as Starfleet officers they must accept some dependency, because in Starfleet no complete independency is possible. The notion of disability as dependency, as a result of gravitational differences and the effects of space travel is a compelling one; other writers have already discussed the physical differences and changes to muscle and bone which might happen to humans living in outer space or on other planets. Melora's clearly successful; as an Ensign, the opportunity to explore the Gamma Quadrant in any way might be deemed a notable opportunity. Her developing romance with Bashir is extremely cute, and I think I'm starting to like Julian. We get some insight into why he's a doctor, why he is the way he is. Melora's just shy of being a Mary Sue, but she's cool. She can even order in Klingon better than Julian. It's hard not to watch this episode and think about cochlear implants today. Lots of Deaf people and their families have opted for the implant lately, and there's lots of discussion in the community about experiences, good and bad. Do you stay who you are, or accept a different way of being? Does physical change really mean identity change? Melora's interested in continuing treatment, but it becomes clear some of her excitement is a simple mirroring of Bashir's own interest. 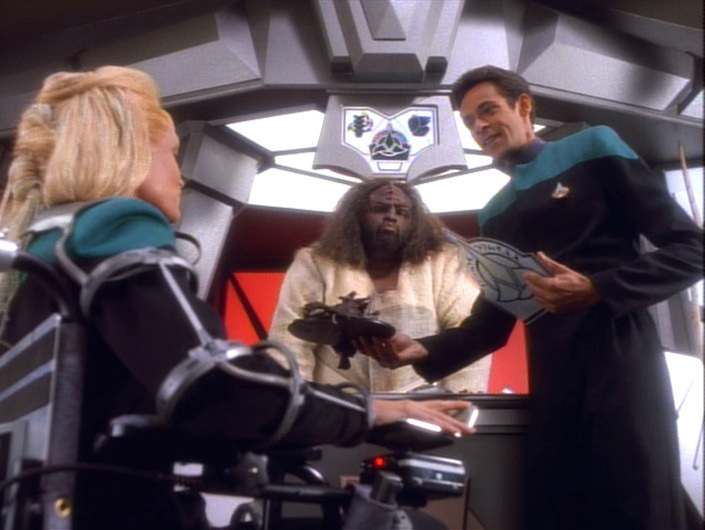 The best part of this plot twist was how easily Bashir accepted it when Melora decided to stop all treatments and revert to her low-gravity state and need for wheelchairs. I was happy Melora recognized her own intrinsic value and saved the crew from the irrational terrorist (and didn't the annoying Quark sub-plot pay off in the most unexpected way?) I don't know if there's an answer to the question of ability or disability in this episode, so much as: we all have to live with what we are, and what we are has value. The end, in the Klingon restaurant on the Promenade, is fantastically bittersweet. Two ships met in the night, and are now passing: remember, because it may not come again. And this is life in Starfleet. The Klingon scenes were completely, thoroughly entertaining – and in character; Bashir seems to have a preference for the exotic, in dinner as well as dates. The wheelchair was described as unusual and a challenge to replicate – I was a little surprised they don't exist in the future; do no patients who need to rest like to be wheeled around? Oh, did anyone else think he was BSing about never having experienced low gravity? While working in Starfleet? Julian's a bit of a dog, too. Melora pulling a Supergirl at the end. Wee-haw! If slightly overdone. Bashir: Was that an attack? You see, you do it so well, with such charm, it's hard to tell. Melora: I beg your pardon? Bashir: Of course, you mean to. All of these broad shots you fire, it's your way of keeping the rest of the universe on the defensive. Has to be. You're too good at it. Melora: Well, it always seemed to work pretty well. Until now. Bashir: That is the nicest thing you've said to me, or anybody else. Melora: Excuse me, Julian, but I can't eat this. Melora: P'kar tel Durg Le Frakn'l? Chef: Dug a bul, rah'tar! Melora: D'tel klop a bul! Chef: I like a customer who knows what she wants. Melora: G'denna. (To an astonished Bashir) There's nothing worse than half dead Racht. Dax: Could it be that Doctor Bashir's bedside manner's won you over? Melora: Our species are just so different. Dax: Since when has that ever stopped anybody? I knew a hydrogen-breathing Lothra who fell hopelessly in love with an Oxygene. Melora: You're kidding! How could they even be in the same room? Dax: Forty minutes a day without their breathing apparatus, that's all. Fifty seven years they were together. A quiet little episode with some things to recommend it, but after the tension of the previous episode, it feels a bit of a let-down. Three out of four squirming worm plates with apricot. I must say that you found a lot to like in this episode! It does have interesting themes, but it's so heavy-handed, as if gravity is pulling it down. I also thought that Julian's reaction to weightlessness was rather odd, because wouldn't everyone going through Star Fleet Academy have to experience weightlessness?